Your chances of seeing one alien in Sheffield are small, never mind a selection of them. But that is what people in the city's Peace Gardens were treated to. Some of the best-known monsters from Doctor Who were in the city to entertain fans ahead of the live tour of the show at Sheffield Arena in October. 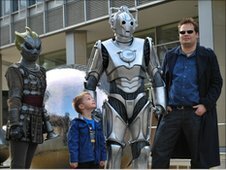 So people in the Peace Gardens got the rare chance to see a Cyberman and Silurian passing the time of day with each other. One fan who got to inspect the Cyberman and Silurian up close was Sara Smith. Originally from Sheffield, she now lives in South Shields and was making a return visit to the city on holiday. And to find Doctor Who monsters in the Peace Gardens was an unexpected treat:"They're quite realistic, especially the Cyberman. I'm a big fan of the show, so this is great." Four-year-old Kristian Bennett from Meersbrook was also there with his dad, Tony. They both took the opportunity to get up close to the aliens. And what was Kristian's verdict on what he saw: "It's cool!" 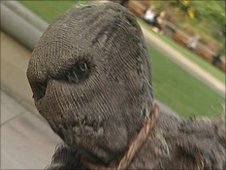 The monsters in the Peace Gardens were some of those who will feature in the Doctor Who tour which arrives at Sheffield Arena in October. Although it is based on the TV series, it will not feature the main actors live on stage - instead Matt Smith who plays The Doctor will appear in specially filmed video clips. The live show is based around a new character, Vorgenson, played by Nigel Planer, who is described as an 'inter-galactic showman' who is the Doctor's biggest fan. Nigel Planer said: "I'm incredibly excited to be joining Doctor Who Live and this role is something of a boyhood dream come true. "My character Vorgenson is the Greatest Showman in the Galaxy and using his incredible invention, 'The Minimiser', he can make any Doctor Who character appear on stage as part of his travelling show dedicated to his hero." 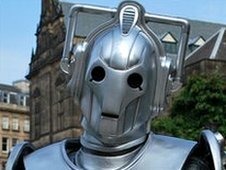 As well as Cybermen, Scarecrows, Oods and Silurians, the audience will also get to see a flying Dalek as part of the show. Paul Anderson and his four-year-old daughter, Poppy, were amongst the fans keen to have their pictures taken with the monsters who appeared in the Peace Gardens. "Poppy's big brother, Will, is going to be so jealous he's missed out on this when we show him the pictures we've taken. He's a fan of the show too." 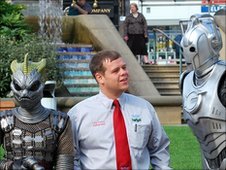 And even though Sheffield's City Centre Ambassadors are trained to deal with the unexpected - being cornered by a Cyberman and Silurian is probably not in their instruction manual. Ambassador Mickey Barnes was not too disturbed though: "They look scary but the Cyberman had a Yorkshire accent, so I know I'm all right." The Doctor Who live show takes place at the Sheffield Arena on 12 and 13 October 2010.